Raising Children in Freedom: Pushing kids into sports, yes or no? Back from the European summer I asked Dave and Alex again if they wanted to play soccer. They both said no, even though some of their friends are doing it and enjoying it. So I said, 'What about basketball then?' Dave said ok, he'd give it a try. Alex said no, but since Dave was doing it he would go along. Knowing my children, I talked to one of the coaches first and asked whether it would be possible to go to the first session rather than pay for the full term upfront. He said that was no problem, but really it was unnecessary because the kids would love it, that was guaranteed. I listened and nodded to everything he said, but something already didn't agree with me. I don't think maths is boring. I love maths! I love numbers so much that I want my kids to share the love and fun of it. That's why I don't make them do maths as in let's sit down and write down some sums. Instead, we talk about numbers and money when we deal with it in real life situations, like selling our free range eggs, for example, a little job they have started doing. So, if they must play basketball mainly because they must have ball skills, I'm not interested anymore. I just thought of it as a way for them to have fun and make new friends. It's funny because the more people tell me that I have to push the kids into sports the more my inner voice tells me that I don't. I don't understand why a seven-year-old who has become the best player still cries every time he has to play. It is a success story because he is the best! But so what? I don't care if my kids are the best or the worst. To me, this sounds too much like babies who are left to cry until they fall asleep. They scream and cry, but when they finally fall asleep they're the best sleepers in the world. And what about the stress and anxiety they have to go through? It might go unnoticed by the parents but not by the brain of the developing child. I think children are people too and, as always, I try to treat them with respect and not do to them what I wouldn't like done to me. And I don't like to be pushed. The times I have been pushed into doing something that I didn't want to do, both as a child and as an adult, all I was left with was resentment for the people who pushed me. 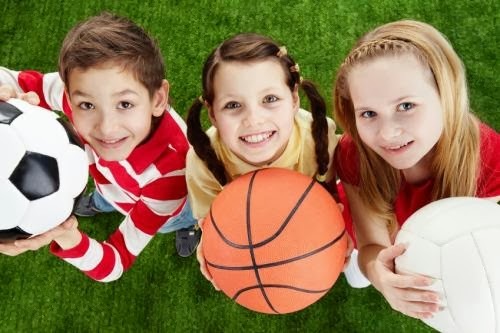 Most parents seem to think it is necessary to enroll their children into sports and after school activities and have them do as many things as possible rather than focus on something they're really passionate about. Well, I don't. I was encouraged to learn how to swim at a very young age. For some reason, that was important to my parents, but that's about it. Apart from that, I played. On the streets, at playgrounds. No lessons, just free unstructured play. When I was eleven, my sister wanted to do ballet, so my mum enrolled us both in the same class without asking me first. I was furious! I didn't want to dance, but she had already paid for the term. So I went, reluctantly, and thought that since I had to do it I might as well try and excel at it. My sister hated it and quit after just one term. I did too, mainly because I was a tomboy who had never before worn pink and was still upset about not having been asked first. At fourteen I started playing ping-pong and tennis of my own accord, without anybody pushing me into it. I became good at both and asked my parents to pay for tennis lessons, which they gladly did. I use my own experience and intuition to guide me, and I still believe that every child has the right to develop at its own pace and they don't need to be pushed, only exposed to the myriad of possibilities. It is never too late to learn a skill, and I don't see the benefits of starting them on tennis lessons at five, for example, unless they really want to do it or the parents want them to become tennis pros. As for the team skills that my friend was referring to, while it would be nice to see the kids playing in a team (maybe some day, there is no rush), I don't think you have to play a team sport to develop them. We already are a team at home. We make decisions together, we negotiate. I'm neither an authoritative parent nor a permissive one, like some people might be inclined to think. They don't always do what they want. That is impossible when you live in society. Sometimes they have to yield to my wishes, like I do to theirs. Or to their friends', or to the person who is looking after them when I go to work. It's all about compromising and negotiating (not bribing). Curiously, I would have loved my parents had pushed me into sports. I was a danger on my roller skates from an early age, and when I discovered basketball it was like something klicked and i was absolutely sure that was what I wanted to devote my life to! Unfortunately, my parents were never interested in taking me to any kind of class, so it was always me fighting against their will and feeling permanently frustrated about their lack of collaboration. Now, it does not seem it is the case with Dave and Alex, but I tend to agree with your intuition. Forcing ANYBODY to do something feels like a recipe for disaster. Who knows? Perhaps in a couple of years' time, they will be asking you to take them to basketball because they want to share the experience with some friend. Hello, dear Mercè and thanks for your comment! Once thing is pushing them and a totally different one is exposing them to the myriad of possibilities. I agree with you that your parents were wrong in not trying to get you interested in more sports and activities.